This article is about the country officially called Commonwealth of Australia. For the continent, see Australia (continent). For other uses, see Australia (disambiguation). Australia ( i/əˈstreɪliə/, /ɒ-/, /-ljə/), officially the Commonwealth of Australia, is a country comprising the mainland of the Australian continent, the island of Tasmania and numerous smaller islands. It is the world's sixth-largest country by total area. The neighbouring countries are Papua New Guinea, Indonesia and East Timor to the north; the Solomon Islands and Vanuatu to the north-east; and New Zealand to the south-east. Australia's capital is Canberra, and its largest urban area is Sydney. For about 50,000 years before the first British settlement in the late 18th century, Australia was inhabited by indigenous Australians, who spoke languages classifiable into roughly 250 groups. After the European discovery of the continent by Dutch explorers in 1606, Australia's eastern half was claimed by Great Britain in 1770 and initially settled through penal transportation to the colony of New South Wales from 26 January 1788. The population grew steadily in subsequent decades, and by the 1850s most of the continent had been explored and an additional five self-governing crown colonies established. On 1 January 1901, the six colonies federated, forming the Commonwealth of Australia. Australia has since maintained a stable liberal democratic political system that functions as a federal parliamentary constitutional monarchy comprising six states and several territories. The population of 24 million is highly urbanised and heavily concentrated on the eastern seaboard. Australia has the world's 13th-largest economy and ninth-highest per capita income (IMF). With the second-highest human development index globally, the country ranks highly in quality of life, health, education, economic freedom, and civil liberties and political rights. Australia is a member of the United Nations, G20, Commonwealth of Nations, ANZUS, Organisation for Economic Co-operation and Development (OECD), World Trade Organization, Asia-Pacific Economic Cooperation, and the Pacific Islands Forum. The name Australia (pronounced [əˈstɹæɪljə, -liə] in Australian English) is derived from the Latin Terra Australis ("southern land") a name used for putative lands in the southern hemisphere since ancient times. 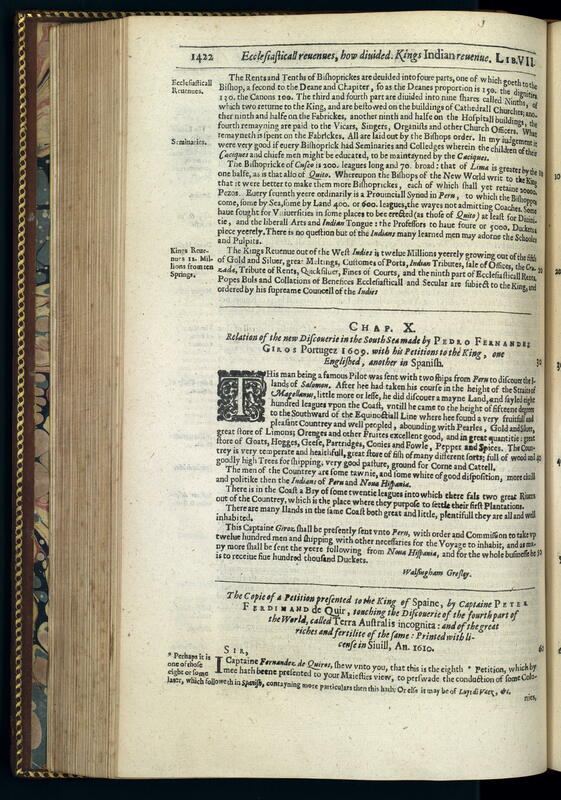 The earliest recorded use of the word Australia in English was in 1625 in "A note of Australia del Espíritu Santo, written by Sir Richard Hakluyt", published by Samuel Purchas in Hakluytus Posthumus, a corruption of the original Spanish name "Austrialia del Espíritu Santo" (Southern Land of the Holy Spirit) for an island in Vanuatu. The Dutch adjectival form Australische was used in a Dutch book in Batavia (Jakarta) in 1638, to refer to the newly discovered lands to the south. The first time that the name Australia appears to have been officially used was in a despatch to Lord Bathurst of 4 April 1817 in which Governor Lachlan Macquarie acknowledges the receipt of Matthew Flinders' charts of Australia. On 12 December 1817, Macquarie recommended to the Colonial Office that it be formally adopted. In 1824, the Admiralty agreed that the continent should be known officially as Australia. The first official published use of the term Australia came with the 1830 publication of "The Australia Directory". Human habitation of the Australian continent is estimated to have begun between 42,000 and 48,000 years ago, possibly with the migration of people by land bridges and short sea-crossings from what is now Southeast Asia. These first inhabitants may have been ancestors of modern Indigenous Australians. At the time of European settlement in the late 18th century, most Indigenous Australians were hunter-gatherers, with a complex oral culture and spiritual values based on reverence for the land and a belief in the Dreamtime. The Torres Strait Islanders, ethnically Melanesian, were originally horticulturists and hunter-gatherers. The northern coasts and waters of Australia were visited sporadically by fishermen from Maritime Southeast Asia. The indigenous population, estimated to have been between 750,000 and 1,000,000 in 1788, declined for 150 years following settlement, mainly due to infectious disease. Thousands more died as a result of frontier conflict with settlers. A government policy of "assimilation" beginning with the Aboriginal Protection Act 1869 resulted in the removal of many Aboriginal children from their families and communities—often referred to as the Stolen Generations—a practice which may also have contributed to the decline in the indigenous population. As a result of the 1967 referendum, the Federal government's power to enact special laws with respect to a particular race was extended to enable the making of laws with respect to Aborigines. Traditional ownership of land ("native title"), was not recognised until 1992 when the High Court of Australia held in Mabo v Queensland (No 2) that the legal doctrine that Australia had been terra nullius ("land belonging to no one") did not apply to Australia at the time of British settlement. The climate of Australia is significantly influenced by ocean currents, including the Indian Ocean Dipole and the El Niño–Southern Oscillation, which is correlated with periodic drought, and the seasonal tropical low-pressure system that produces cyclones in northern Australia. These factors cause rainfall to vary markedly from year to year. Much of the northern part of the country has a tropical, predominantly summer-rainfall (monsoon) The south-west corner of the country has a Mediterranean climate. Much of the south-east (including Tasmania) is temperate. In September 2015, Malcolm Turnbull successfully challenged Abbott for leadership of the Coalition, and was sworn in as the 29th Prime Minister of Australia. The most recent federal election was held on 2 July 2016 and resulted in the Coalition forming a majority government. Under the constitution, the States essentially have plenary legislative power to legislate on any subject, whereas the Commonwealth (federal) Parliament may only legislate within the subject areas enumerated under section 51. For example, State parliaments have the power to legislate with respect to education, criminal law and state police, health, transport, and local government, but the Commonwealth Parliament does not have any specific power to legislate in these areas. However, Commonwealth laws prevail over State laws to the extent of the inconsistency. In addition, the Commonwealth has the power to levy income tax which, coupled with the power to make grants to States, has given it the financial means to incentivize States to pursue specific legislative agendas within areas over which the Commonwealth does not have legislative power. Over recent decades, Australia's foreign relations have been driven by a close association with the United States through the ANZUS pact, and by a desire to develop relationships with Asia and the Pacific, particularly through ASEAN and the Pacific Islands Forum. In 2005 Australia secured an inaugural seat at the East Asia Summit following its accession to the Treaty of Amity and Cooperation in Southeast Asia, and in 2011 attended the Sixth East Asia Summit in Indonesia. Australia is a member of the Commonwealth of Nations, in which the Commonwealth Heads of Government meetings provide the main forum for co-operation.File:Australian soldiers from the 2nd Battalion, Royal Australian Regiment conducts a foot patrol during exercise Talisman Sabre 2007.jpgAustralia has pursued the cause of international trade liberalisation. It led the formation of the Cairns Group and Asia-Pacific Economic Cooperation. Australia is a member of the Organisation for Economic Co-operation and Development and the World Trade Organization, and has pursued several major bilateral free trade agreements, most recently the Australia–United States Free Trade Agreement and Closer Economic Relations with New Zealand, with another free trade agreement being negotiated with China—the Australia–China Free Trade Agreement—and Japan, South Korea in 2011, Australia–Chile Free Trade Agreement, and as of November 2015 has put the Trans-Pacific Partnership before parliament for ratification. In the 2015–16 budget, defence spending was A$31.9 billion or 1.92% of GDP, representing the 13th largest defence budget. Australia has been involved in UN and regional peacekeeping, disaster relief and armed conflict, including the 2003 invasion of Iraq; it currently has deployed about 2,241 personnel in varying capacities to 12 international operations in areas including Iraq and Afghanistan. File:Gold Coast skyline.jpg Until the Second World War, the vast majority of settlers and immigrants came from the British Isles, and a majority of Australians have some British or Irish ancestry. In the 2011 Australian census, the most commonly nominated ancestries were English (36.1%), Australian (35.4%), Irish (10.4%), Scottish (8.9%), Italian (4.6%), German (4.5%), Chinese (4.3%), Indian (2.0%), Greek (1.9%), and Dutch (1.7%). Australia's population has quadrupled since the end of World War I, much of this increase from immigration. Following World War II and through to 2000, almost 5.9 million of the total population settled in the country as new immigrants, meaning that nearly two out of every seven Australians were born in another country. Most immigrants are skilled, but the immigration quota includes categories for family members and refugees. By 2050, Australia's population is currently projected to reach around 42 million. Nevertheless, its population density, 2.8 inhabitants per square kilometre, remains among the lowest in the world. Indigenous Australian rock art is the oldest and richest in the world, dating as far back as 60,000 years and spread across hundreds of thousands of sites. Traditional designs, patterns and stories infuse contemporary Indigenous Australian art, "the last great art movement of the 20th century"; its exponents include Emily Kame Kngwarreye. During the first century of European settlement, colonial artists, trained in Europe, showed a fascination with the unfamiliar land. The impressionistic works of Arthur Streeton, Tom Roberts and others associated with the 19th-century Heidelberg School—the first "distinctively Australian" movement in Western art—gave expression to a burgeoning Australian nationalism in the lead-up to Federation. While the school remained influential into the new century, modernists such as Margaret Preston, and, later, Sidney Nolan and Arthur Boyd, explored new artistic trends. The landscape remained a central subject matter for Fred Williams, Brett Whiteley and other post-World War II artists whose works, eclectic in style yet uniquely Australian, moved between the figurative and the abstract. The National Gallery of Australia and state galleries maintain collections of Australian and international art. Australia has one of the world's highest attendances of art galleries and museums per head of population. File:Sidney Nolan Snake.jpg Australian literature grew slowly in the decades following European settlement though Indigenous oral traditions, many of which have since been recorded in writing, are much older. 19th-century writers such as Henry Lawson and Banjo Paterson captured the experience of the bush using a distinctive Australian vocabulary. Their works are still popular; Paterson's bush poem "Waltzing Matilda" (1895) is regarded as Australia's unofficial national anthem. Miles Franklin is the namesake of Australia's most prestigious literary prize, awarded annually to the best novel about Australian life. Its first recipient, Patrick White, went on to win the Nobel Prize in Literature in 1973. Australian winners of the Booker Prize include Peter Carey, Thomas Keneally and Richard Flanagan. Author David Malouf, playwright David Williamson and poet Les Murray are also renowned literary figures. ↑ Based on the Köppen climate classification. ↑ 2.0 2.1 "Pluralist Nations: Pluralist Language Policies?". 1995 Global Cultural Diversity Conference Proceedings, Sydney. Department of Immigration and Citizenship. Archived from the original on 20 December 2008. Retrieved 11 January 2009. <templatestyles src="Module:Citation/CS1/styles.css"></templatestyles> "English has no de jure status but it is so entrenched as the common language that it is de facto the official language as well as the national language." ↑ 6.0 6.1 "Population clock". Australian Bureau of Statistics website. Commonwealth of Australia. Retrieved 2 May 2017. <templatestyles src="Module:Citation/CS1/styles.css"></templatestyles> The population estimate shown is automatically calculated daily at 00:00 UTC and is based on data obtained from the population clock on the date shown in the citation. ↑ 16.0 16.1 Davison, Hirst and Macintyre, pp. 157, 254. ↑ Data refer mostly to the year 2014. World Economic Outlook Database-April 2015[dead link], International Monetary Fund. Accessed on 25 April 2015. ↑ "Australia" December 2016/https://web.archive.org/web/20161223032232/http://www.etymonline.com/index.php?term=australia Archived December 23, 2016 at the Wayback Machine – Online Etymology Dictionary. Retrieved 28 October 2015. ↑ "He named it Austrialia del Espiritu Santo and claimed it for Spain" August 2013/https://web.archive.org/web/20130817051612/http://www.sl.nsw.gov.au/discover_collections/history_nation/queiros/index.html Archived August 17, 2013 at the Wayback Machine The Spanish quest for Terra Australis | State Library of New South Wales Page 1. ↑ "A note on 'Austrialia' or 'Australia' Rupert Gerritsen – Journal of The Australian and New Zealand Map Society Inc.- The Globe, Number 72, 2013 " June 2016/https://web.archive.org/web/20160612021158/http://rupertgerritsen.tripod.com/pdf/published/Austrialia_Globe_72_2013_pp23-30.pdf Archived June 12, 2016 at the Wayback Machine Posesion en nombre de Su Magestad (Archivo del Museo Naval, Madrid, MS 951) Page 3. ↑ Purchas, vol. iv, pp. 1422–32, 1625. This appears to be variation of the original Spanish "Austrialia" [sic]. A copy at the Library of Congress can be read online "Archived copy". Archived from the original on 14 September 2016. Retrieved 2015-07-14. CS1 maint: Archived copy as title (link) <templatestyles src="Module:Citation/CS1/styles.css"></templatestyles>. ↑ 40.0 40.1 Davison, Hirst and Macintyre, p. 233. ↑ Convict Records Public Record office of Victoria; State Records Office of Western Australia May 2012/https://web.archive.org/web/20120530100051/http://www.sro.wa.gov.au/collection/convict-records Archived May 30, 2012 at the Wayback Machine. ↑ C. Bean Ed. (1941). Volume I – The Story of Anzac: the first phase August 2008/https://web.archive.org/web/20080828064649/http://www.awm.gov.au/histories/ww1/1/index.asp Archived August 28, 2008 at the Wayback Machine, First World War Official Histories, Eleventh Edition. ↑ "Continents: What is a Continent?". National Geographic Society. Retrieved 22 August 2009. <templatestyles src="Module:Citation/CS1/styles.css"></templatestyles> "Most people recognize seven continents—Asia, Africa, North America, South America, Antarctica, Europe, and Australia, from largest to smallest—although sometimes Europe and Asia are considered a single continent, Eurasia." ↑ "Australia". Encyclopædia Britannica. Retrieved 22 August 2009. <templatestyles src="Module:Citation/CS1/styles.css"></templatestyles> "Smallest continent and sixth largest country (in area) on Earth, lying between the Pacific and Indian oceans." ↑ "Islands". Geoscience Australia. Archived from the original on 23 April 2010. <templatestyles src="Module:Citation/CS1/styles.css"></templatestyles> "Being surrounded by ocean, Australia often is referred to as an island continent. As a continental landmass it is significantly larger than the many thousands of fringing islands ..."
↑ "Australia in Brief: The island continent". Department of Foreign Affairs and Trade. Archived from the original on 4 June 2009. Retrieved 29 May 2009. <templatestyles src="Module:Citation/CS1/styles.css"></templatestyles> "Mainland Australia, with an area of 7.69 million square kilometres, is the Earth's largest island but smallest continent." ↑ Kelly, Karina (13 September 1995). "A Chat with Tim Flannery on Population Control". Australian Broadcasting Corporation. Archived from the original on 13 January 2010. Retrieved 23 April 2010. <templatestyles src="Module:Citation/CS1/styles.css"></templatestyles> "Well, Australia has by far the world's least fertile soils". ↑ Center for Global Development. Commitment to Development Index: Australia[permanent dead link] , cgdev.org. Retrieved 5 January 2008. ↑ Stockholm International Peace Research Institute (2011). The 15 major spender countries in 2011 March 2010/https://web.archive.org/web/20100328104327/http://www.sipri.org/research/armaments/milex/resultoutput/15majorspenders Archived March 28, 2010 at the Wayback Machine. ↑ Dyett, Kathleen (19 August 2014). "Melbourne named world's most liveable city for the fourth year running, beating Adelaide, Sydney and Perth" December 2016/https://web.archive.org/web/20161221170019/http://www.abc.net.au/news/2014-08-19/melbourne-worlds-most-liveable-city-for-the-fourth-year-running/5681014 Archived December 21, 2016 at the Wayback Machine, ABC News. Retrieved 14 April 2015. ↑ 222.0 222.1 222.2 222.3 Australian Bureau of Statistics. Year Book Australia 2005 April 2016/https://web.archive.org/web/20160409132916/http://www.abs.gov.au/ausstats/abs%40.nsf/94713ad445ff1425ca25682000192af2/1a79e7ae231704f8ca256f720082feb9%21OpenDocument Archived April 9, 2016 at the Wayback Machine. ↑ "Reflecting a Nation: Stories from the 2011 Census, 2012–2013". Australian Bureau of Statistics. 21 June 2012. Retrieved 25 June 2012. <templatestyles src="Module:Citation/CS1/styles.css"></templatestyles> The census table is annotated: "As some people stated two ancestries, the total persons for all ancestries exceed Australia's total population." ↑ NCLS releases latest estimates of church attendance August 2016/https://web.archive.org/web/20160823165653/http://www.ncls.org.au/default.aspx?docid=2250&track=82083 Archived August 23, 2016 at the Wayback Machine, National Church Life Survey, Media release, 28 February 2004. ↑ QS World University Rankings 2015/16 December 2016/https://web.archive.org/web/20161219182830/http://www.topuniversities.com/university-rankings/world-university-rankings/2015 Archived December 19, 2016 at the Wayback Machine, topuniversities.com. Retrieved 25 January 2016. ↑ Education at Glance 2005 June 2016/https://web.archive.org/web/20160611100744/http://www.oecd.org/education/skills-beyond-school/35345692.pdf Archived June 11, 2016 at the Wayback Machine by OECD: Percentage of foreign students in tertiary education. ↑ 290.0 290.1 Teo and White, pp. 121–23. ↑ 295.0 295.1 295.2 295.3 Australian art August 2016/https://web.archive.org/web/20160819232829/http://www.artgallery.nsw.gov.au/discover-art/learn-more/australian-art/ Archived August 19, 2016 at the Wayback Machine, Art Gallery of New South Wales. Retrieved 27 August 2014. ↑ Brett Whiteley: Nature August 2016/https://web.archive.org/web/20160820041510/http://www.artgallery.nsw.gov.au/exhibitions/brett-whiteley-nature/ Archived August 20, 2016 at the Wayback Machine, Art Gallery of New South Wales. Retrieved 15 April 2015. ↑ Australia's Nobel Laureates and the Nobel Prize August 2016/https://web.archive.org/web/20160819205739/http://www.australia.gov.au/about-australia/australian-story/australias-nobel-laureates Archived August 19, 2016 at the Wayback Machine, australia.gov.au. Retrieved 17 April 2015. ↑ Hughes-D'Aeth, Tony (15 October 2014). "Australia's Booker prize record suggests others will come in Flanagan's wake" August 2016/https://web.archive.org/web/20160822182813/http://theconversation.com/australias-booker-prize-record-suggests-others-will-come-in-flanagans-wake-33025 Archived August 22, 2016 at the Wayback Machine, The Conversation. Retrieved 17 April 2014. ↑ Quinn, Karl (6 December 2015). "Australian film has had its biggest year at the box office ever. Why?" December 2016/https://web.archive.org/web/20161229165041/http://www.smh.com.au/entertainment/movies/australian-film-has-had-its-biggest-year-at-the-box-office-ever-why-20151204-glfut3.html Archived December 29, 2016 at the Wayback Machine, The Sydney Morning Herald. Retrieved 17 February 2016. ↑ "Ten Great Australian Moments at the Oscars" March 2014/https://web.archive.org/web/20140308090335/http://www.news.com.au/entertainment/awards/ten-great-australian-moments-at-the-oscars/story-e6frfpli-1226841441307 Archived March 8, 2014 at the Wayback Machine (26 February 2014), news.com.au. Retrieved 7 February 2016. ↑ Barr, Trevor. "Media Ownership in Australia May 2012/https://web.archive.org/web/20120512222707/http://www.australianpolitics.com/issues/media-ownership/1999ownership.shtml Archived May 12, 2012 at the Wayback Machine", australianpolitics.com. Retrieved 2 January 2008. ↑ National Sports Museum Heritage Listing[permanent dead link], National Sports Museum. Retrieved 15 April 2015. This page was last modified on 5 May 2017, at 02:12.